In the past, buttonholes symbolized good luck and divine love, especially red ones that were the masculine symbol of love. Grooms wore them at their wedding to signify that they were bound with the promise to marry. Traditionally the groom, best man, fathers of the bride and groom and ushers should all wear buttonholes. These are made up of a single flower and a piece of foliage, worn in their left lapel. Other honoured guests such as uncles, grandparents and close friends of the bridal couple may also wear buttonholes. Generally, it is safe to choose buttonholes that are of the same variety of flower or colour as the bride’s bouquet. Some couples choose to provide all their guests with a buttonhole each. The most popular choices of flowers for buttonholes are carnations and roses. The stem is fitted through the buttonhole on the left lapel and fixed into place with a pin at the back and is positioned upright. To avoid any sign of the pin, simply thread it through one thickness only of the lapel material. Corsages are a slightly larger version of a buttonhole, which are made up of the same flowers as those in the bride’s bouquet, and should be worn on the left lapel. They are made up of two or three flowers, along with some foliage. The mothers of the couple will wear corsages, and so too may the grandmothers. If you would like to give other family members something to wear, you could give them a double buttonhole made up of two blooms. This will give them significance during the wedding, and can be used for family members such as sisters. It is important to make sure that the corsages match the women’s outfits, so you should find out the colours of their outfits before ordering the corsages to avoid any colour clashes. Popular choices for corsages include carnation, orchid, rose, stephanotis and freesia. Buttonholes and corsages should be attached once you arrive at the wedding, to avoid the possibility of seatbelts ruining them during the journey to the wedding ceremony. 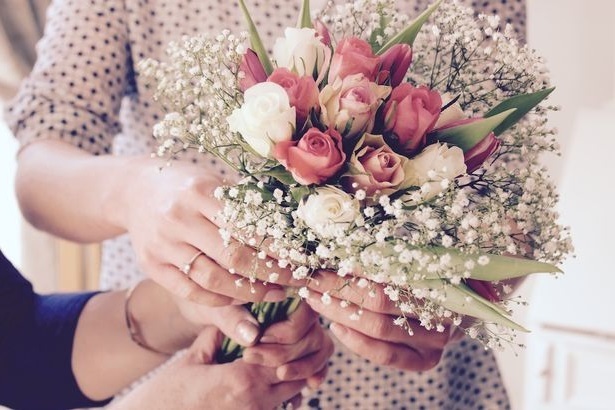 A corsage or buttonhole is a nice token of thanks and appreciation for other people who participate in your wedding day, such as those who give readings or sing during the ceremony. Some brides like to order matching corsage to wear with their going away outfit. As an alternative for hay fever sufferers, a dried or silk arrangement could be made in similar colours and styles to the fresh ones. Will the flowers last all day without wilting? Will they last all day without slipping out of place? Will they be comfortable to wear all day? Do the flowers need the pollen or any sharp parts removed? Asking your florist for a selection of loose flowers to wear in your hair, will work out cheaper and be much more versatile than a floral circlet or Alice band. An extremely complicated hairstyle with pleats and curls will not need an intricate floral headdress; a few loose flowers will complement the style much better. A popular choice at the moment is for a cluster of flowers to be placed on top of the head, or for single flowers to be placed in the hair. Headdresses that are made up of spiky flowers and foliage may catch on the delicate fabric of a veil. Suitable flowers for headdresses include: daisy, frangipani, freesia, gardenia, gypsophilia, mimosa, rosebuds, tuberose and wax flower. Once you have decided on a few types of flowers that you would like to consider, arrange a consultation with your hairdresser to discuss your ideas and how they may be implemented.